1) Turn off the TV!!! News stories like this are especially frightening to children. They raise issues of their own personal safety in a very visceral and graphic way. The evolving story has been going on for days, and who knows how much longer it will take until the city of Boston returns to normal? If your young children are around, find a way to get your breaking news in other ways, like the Internet. There’s lots of research from 9/11 that shows that the greatest predictor of long-term post-traumatic stress reactions among children who didn’t experience that event directly was how much time children spent watching TV in the week following the attack. This was true of adults, too, by the way. At any age, it’s enormously stressful and unnerving to follow these events non-stop. For your own mental health, give yourself generous breaks from the coverage and check in on updates from from time to time. 2) Know that children of different ages will respond differently. Up to the age of about 6, children aren’t really sure about the difference between reality and fiction. This age group may not realize the implications of an event like this and may respond as though this were just another TV show. They are most like to be upset by images of bloodied victims, the fear expressed by witnesses and how upset their parents are. Try to express your own anxiety and frustration out of the range of their eyes and ears. As children get older, they will comprehend the events more and more. 3) Keep your child’s age in mind when helping them cope. Remind them that when things like this have happened before, we’ve found ways to protect ourselves. 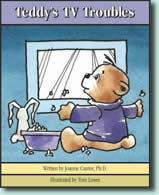 After 9/11, because so many people were looking for ways to calm younger children, I wrote a children’s book called “Teddy’s TV Troubles” that parents could read with their children to help them get over their fears. It’s about a little bear who was scared about something (unspecified) that he saw on TV, and it shows Teddy and Mama Bear doing things that make children feel better. Lots of parents have found it helpful in these situations. It’s available at Amazon.com and on my website.